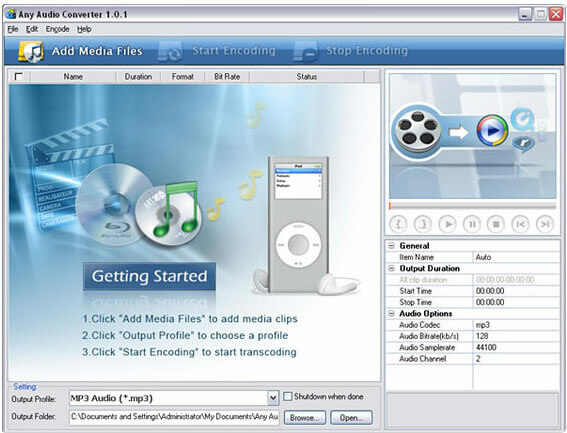 This software designed for extracting audio from video and converting audio between popular formats, such as WMV, MP4, WAV, WMA, OGG, AAC, MP3, M4A, MP2, etc.You can convert audio between MP3, WMA, WAV, AAC and OGG as well as video files including AVI, MPEG, MP4, WMV, ASF, etc to popular audio files, e.g. convert MP4 to MP3. The user-friendly interface of Any Audio Converter lets you add and convert any unprotected audios and videos to MP3, WMA, AAC and OGG easily. Most work can be done automatically with a few mouse clicks.